Hours of Creativity, Fun & Entertainment! Are you looking for a fun and simple way to keep the kids occupied that doesn’t involve turning on the TV or computer? Do you have a budding little artist in your life who would love the chance to try a new craft? Slimemaster’s Crystal Slime Making Kit contains everything kids need to make magical works of art and play silly slime games without the mess! Mold, shape, squish, squeeze, knead, fold, and stretch your slime to the limit! This 51 pc. kit comes with everything kids need to make their creations glittery, spacey, fluffy, shiny, crunchy, fruity and cut into any shape they can imagine! ✅ FUN & CREATIVE SLIME MAKING – Kids absolutely love to squish, squeeze, mix and make their own colorful concoctions & stretchy, gooey masterpieces using Slimemaster’s Crystal Slime Making Kit. This large pack keeps kids occupied for hours as they stretch their imaginations and exercise their creative artistry! ✅ ALL THE BEST INGREDIENTS + STORAGE BOX – This slime kit comes with everything your kids need to spend the afternoon wrapped up in a world of vibrant colors, squishy textures, glitzy glitter and other fun foam materials & tools to customize their crafting. The 24 slime containers have lids and are shrink-wrapped to avoid spillage. All 51 individual pieces come in a sturdy, plastic resealable storage container with handle. 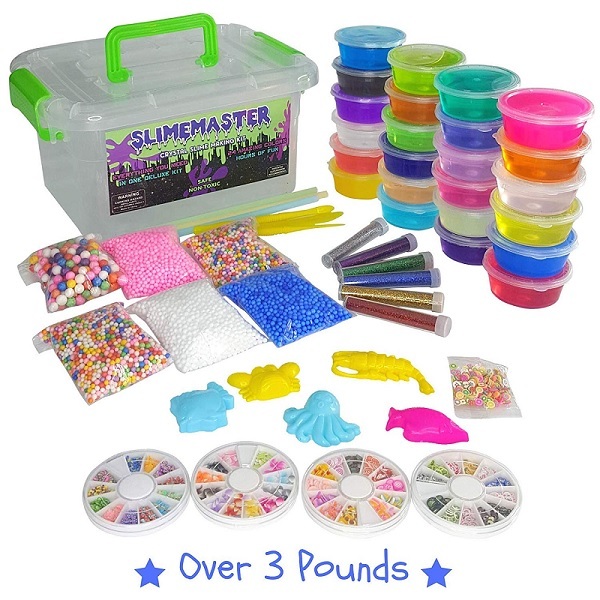 ✅ AMAZING ONE OF A KIND GIFT – The Slimemaster set makes the perfect birthday, Christmas or other holiday gift for boys & girls of different ages. The huge amount of high quality craft supplies that come included makes it easy to share with siblings and friends. Slime arts & crafts are an awesome household activity for rainy days, play dates and children’s birthday parties. Interactive entertainment without screens & smartphones! ✅ RELIEVES STRESS & ANXIETY – The comforting tactile feel of fluffy slime and decorating supplies can help to calm anxious or fidgety children. Slime is 100% Kid-Friendly. Parents never have to worry – all of our materials are washable and easy to clean up. Recommended for ages 6+. .✅ JOIN TONS OF HAPPY CUSTOMERS – We can’t wait to add you to our long list of customers getting the most out of their Crystal Slime Making Kit… all the enthusiastic kids and the relieved parents keeping them occupied.